Anastrepha edentata Stone has been collected in the Florida keys in every month of the year, but its host plants still are unknown. 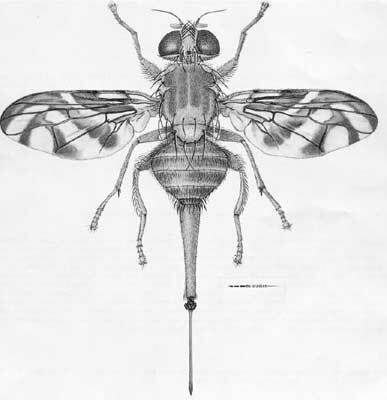 It is one of six species of fruit flies of the genus Anastrepha which occur in Florida or which have been established in Florida at some time. According to Division of Plant Industry records, it has not been found in Florida since 1936. There is a possibility that this species has not survived in Florida. It is not considered to be of economic importance anywhere within its range. Known in Florida and Puerto Rico. In Florida this species has been recorded from Key Largo Key to Key West. There is a record for Redlands, Dade County, Florida. The type locality is Key Largo, Florida. Figure 1. 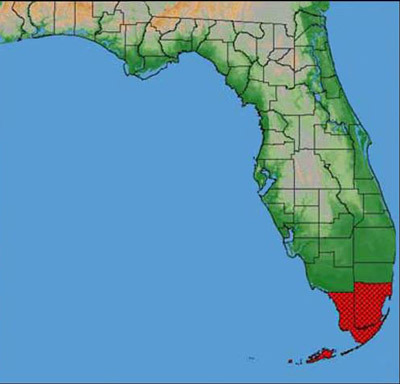 Recorded Florida distribution of Anastrepha edentata Stone, a fruit fly. Figure by Division of Plant Industry. This is a small, yellow-brown fly with patterned wings. The female has a long, slender ovipositor sheath and very slender ovipositor, which readily distinguishes it from other Anastrepha species recorded from Florida. The head is yellow with the frontal bristles and ocellar triangle black, while the antennae are yellow. The humerus has a very narrow median strip widening abruptly on the mesoscutum posteriorly. The lateral stripes from the transverse suture to scutellum and scutellum are pale yellow. The metanotum is entirely yellow brown. The Macrochaetae are black, with the pile a pale yellow brown. The legs are yellow. The wing pattern is partly yellowish, partly brownish infuscated, and is somewhat variable. In some specimens, the inverted V band is connected at its apex with the S band on the anterior portion of the wing, while in others the inverted V band is separated from the S band; but usually it is complete and joined to the S band. The costal and 3 bands are widely separated on vein R4+5 but on vein R2+3 they vary from widely separated to connected here, or all of R1 infuscated between the two bands. Figure 2. Adult female. Drawing by Division of Plant Industry. Figure 3. Ovipositor tip. Drawing by Division of Plant Industry. The life history of Anastrepha edentata has not been ascertained. State Plant Board of Florida Eleventh Biennial Report for the period July 1, 1934-June 30, 1936. Jan. 1937. pp. 20-21. Anastrepha sp. "F," Brown. Author: H.V. Weems, Jr., Florida Department of Agriculture and Consumer Services, Division of Plant Industry. Originally published as DPI Entomology Circular 76.